Now you can easily and inexpensively dock and secure your fishing boat, daysailer or other lightweight boat out of the water, right on your shoreline. 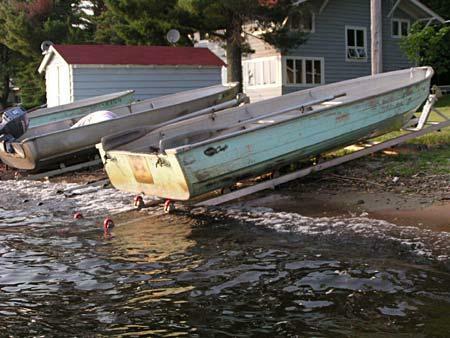 This versatile, adjustable roller ramp shore dock can be used for small watercraft up to 750 lbs. The 750 boat ramp includes 12 polyurethane, non-marring "donut" style rollers, a ground anchoring kit and a standard 1100 lb. 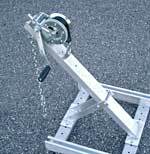 winch with 20' strap. With two rail width settings and three winch height adjustments the 750 roller ramp shore dock can accommodate many types of watercraft. 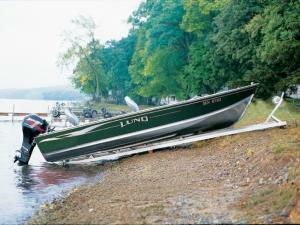 Rail width adjusts from 21" to 24" to fit most small boats. At just 92 lbs the Roll-n-Go roller ramp shore dock can be readily disassembled into sections for easy storage over the winter. MAX. WEIGHT CAPACITY 750 lbs. OVERALL WIDTH Adjustable 21"- 24"
RAIL WIDTH Adjustable 21"- 24"